Happy New Year of 2010!!! I hope you all have lots of fun! 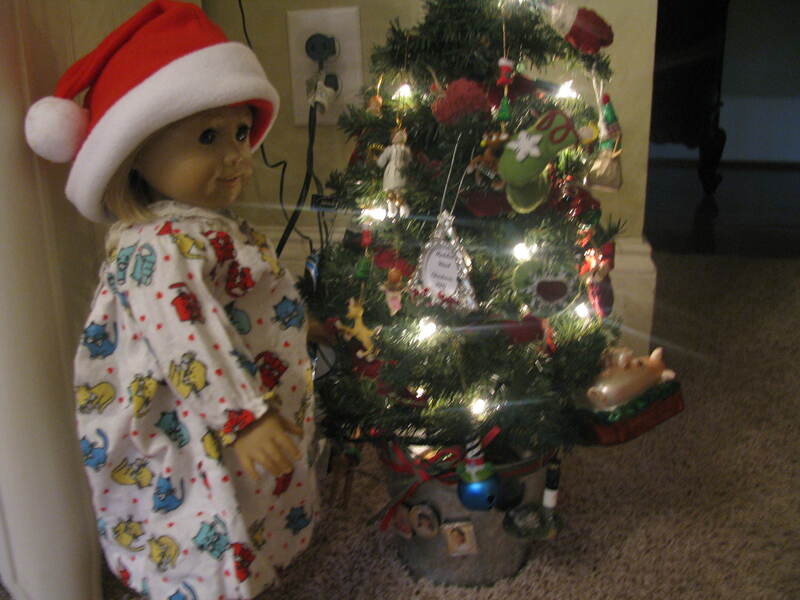 I know lots of you and your dolls are going to try to stay up until 12:00 AM. Maybe some of you will throw parties, have fun with friends and family, and put off fun fire-crackers or fireworks (I am hearing some right now down the street!!!) 2009 was a great year filled with family, friends, and fun!!! 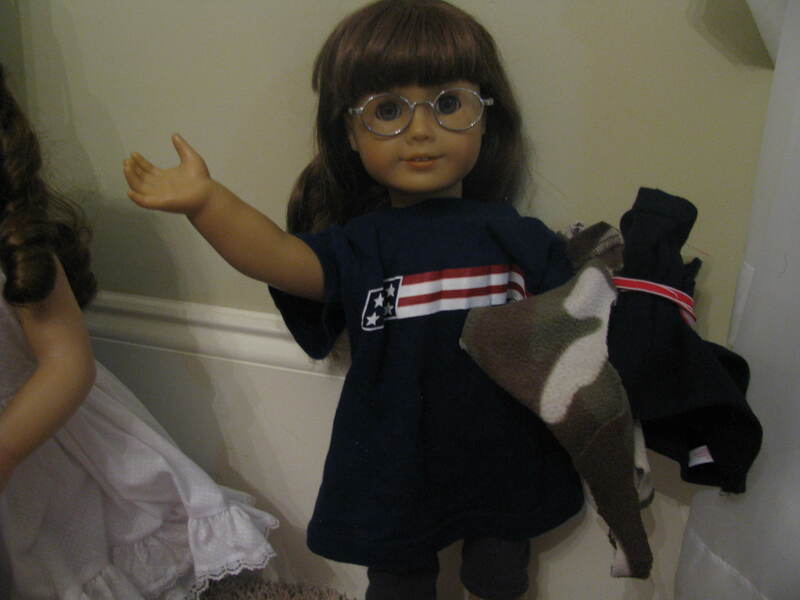 2010 will also bring us new dolls and fun with American Girl. Welcoming Lanie Holland to the world of AG! Today I went to the bookstore and got the very first Lanie book. I am already on Chapter 6. It is a really good book! 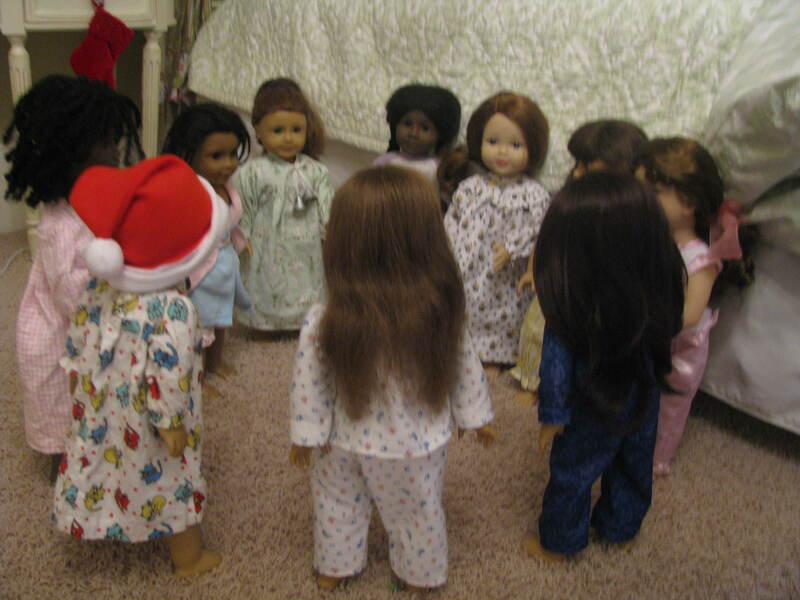 I will be posting the New Year Party with my dolls either tomorrow or January second, including the dolls staying up to watch the ball drop!!! So be HERE, but if you cannot make it…. HAPPY NEW YEAR 2010 TO ALL!!!!!!!!!!!!! Anyway, I hope you all have a fun and safe NEW YEAR!!!! hey people it me samantha. hello. madeline said i um could post here. you see though i not very good on computer so please excuse me. thanks. ok so you all know we (“Lulu, how do you caps things?” “Here, you press this button then the light comes on..” “Ok, thanks.”) TOTALLY forgot the whole christmas morning thing. wah wah waha waha wah cry sob cry sob! its all kit’s fault. she forgot to take pictures. well maybe its NOT but still im not going to blame MADELINE she is my human and this is her blog. well anyway sorry about that. wah wah wahha sob cry sobbb please forgive me and the dolls. we mean no harm. next year. or maybe just later. but no promises. oops. but im sure your wondering what we got. 1. we got a really cool doll locker from madeline’s friend lindsay. 2. travel-the-world kid playset with a little paper passport and everything. 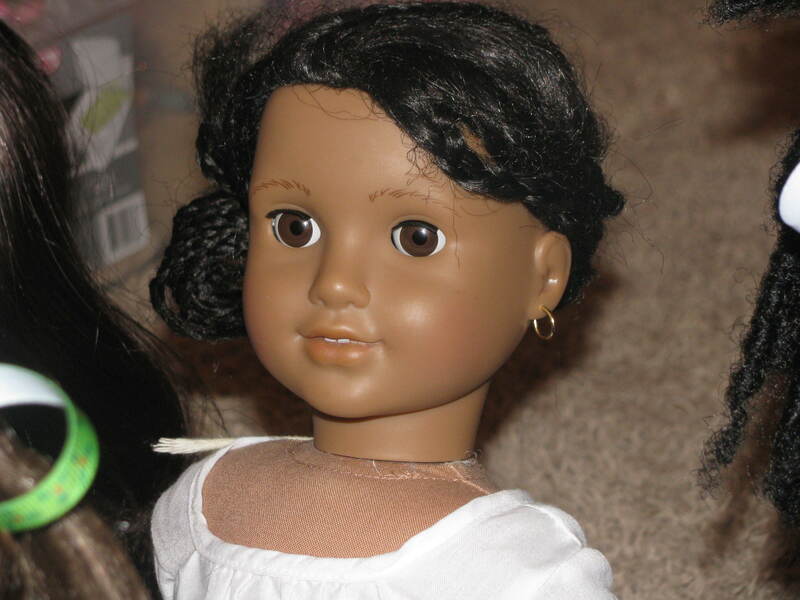 3. we got a new doll (mini doll) her name is nellie. she is my best friend in doll version. 5. new outfit (to share) thats really pretty from madeline’s aunt lisa. and that sort of stuff. pus madeline also got some money from her nana for christmas and she ordered ivy’s chinese dress from american girl for eva grace to wear during chinese new year. yep we got lots of great stuff this year. but here’s the deal. madeline got this….thing that’s supposed to make stuff as long as you give it fabric. like make doll clothes and stuff. it makes weird noises and puts stitches on things and has a pointy needle. am i scared? NO…um, well, STILL it’s pretty freaky. well anyway what we ARE going to do and not forget is stay up until midnight on New Years Eve and watch the ball drop and be the first to see lanie go online. usually molly and lulu stay up and we go to bed but not this year. madeline is gonna let us try. i don’t know about kit addy felicity eva grace elsie and kathleen but me and josefina have made a vow to stay up with the big kids and even the humans. wont that be the coolest. yep it will. thank you everybody. i love you all (like friends i mean) and i think you guys are the greatest. madeline thinks so too. she told me. well anyway thank for coming. YOU KNOW YOU WANNA COMMENT! CAN YOU BELIEVE IT?????? SHE’S FINALLY HERE!!!!!!!!!!!!!! AHHHHHH!!!!!!!!!! We’ve had so many clues and facts and rumors…. but now….. as far as looks goes, all those mishaps are put to the final test. Title says it all. I am going to read the Lanie books all-the-way, because this is the first GOTY I may actually want to get. (I mean, since I’ve gotten into AG.) But if she turns out the way I hope—Get ready for Lanel Amanda Holland in Summer 2010. Hey! Good Morning and Merry Christmas!!!! It’s so great to once again celebrate Jesus’s birthday and all the fun traditions we get to do!!! I hope you all have a safe and blessed Christmas, and that you all get what you wanted! LOL! 7. 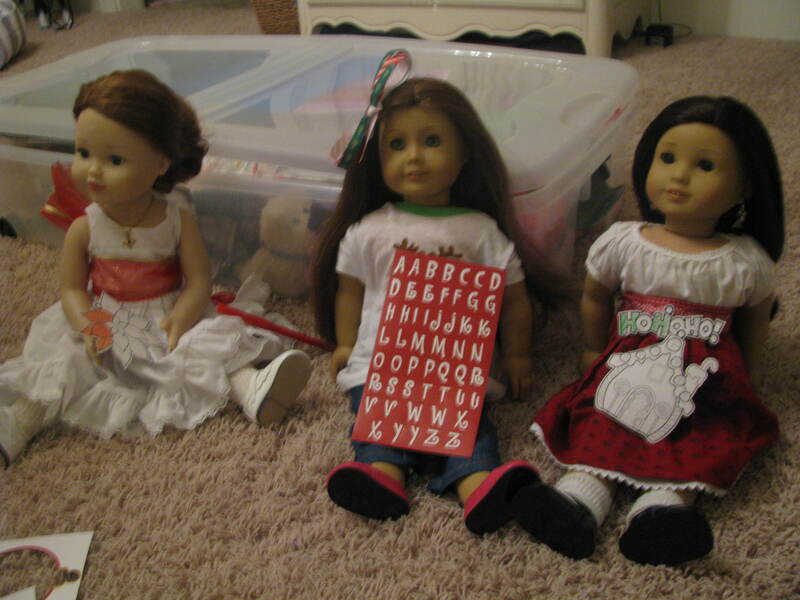 The things my dolls got from ‘Santa Claus’ (me, actually!) LOL! 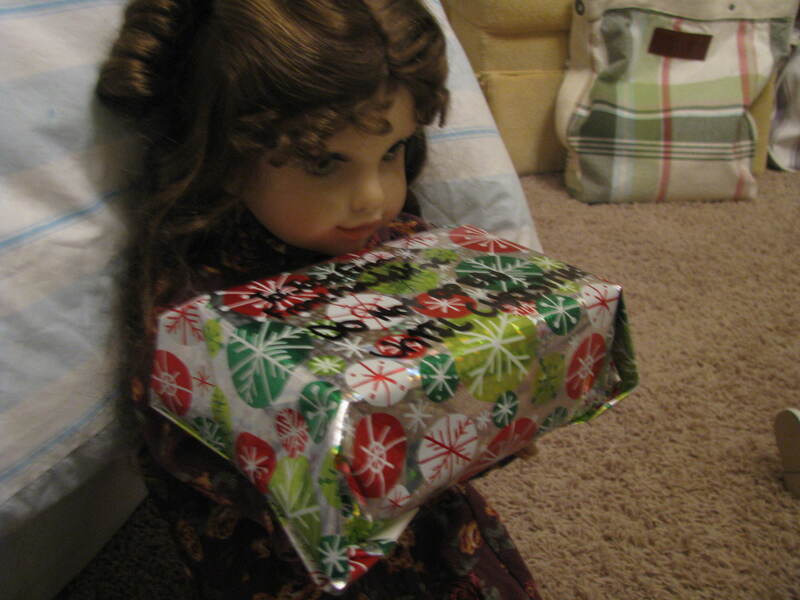 Well, tell me the things you and your doll got for Christmas! It’s not too late to send in pictures!!! We had lots of fun including our usual Christmas Eve dinner and party at my aunt’s house, went home and had lots of fun, made a b-day cake for Jesus, opened presents and stockings, had friends over, etc! Have a GREAT, SAFE, BLESSED, and MERRY CHRISTMAS! HAPPY BIRTHDAY JESUS!!! Molly walked over to the other side of the room. “Look!” she said. “Madeline even gave us our very own stocking! She said that somebody named Santa Claus comes in and leaves presents. He leaves some goodies in the stockings if you hang them up!” The girls cheered at the satin red wonderful stocking that Santa would leave goodies in. Lulu even read them a very cool book called “The Nigth Before Christmas”. Jitters of excitement filled the girls. 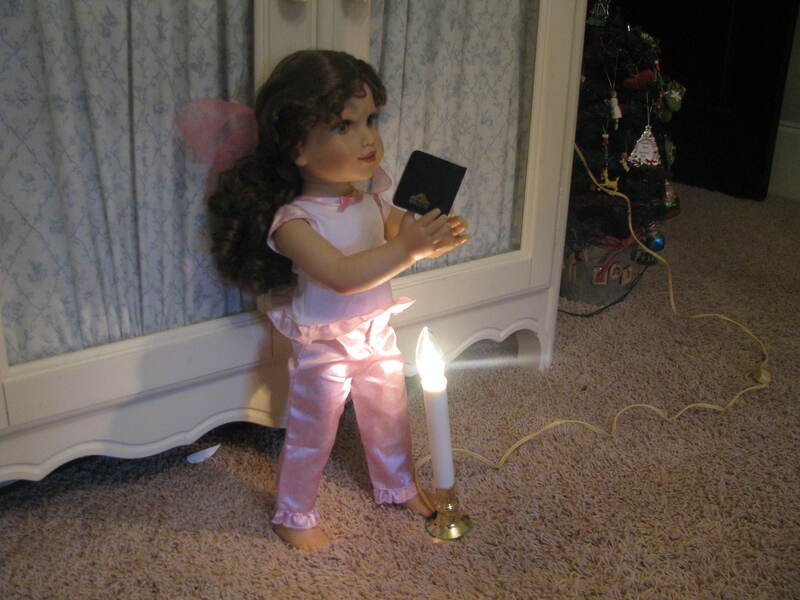 Because they could not attend Christmas Eve Candle Lighting Services, Elsie did her own with the,! LOL! 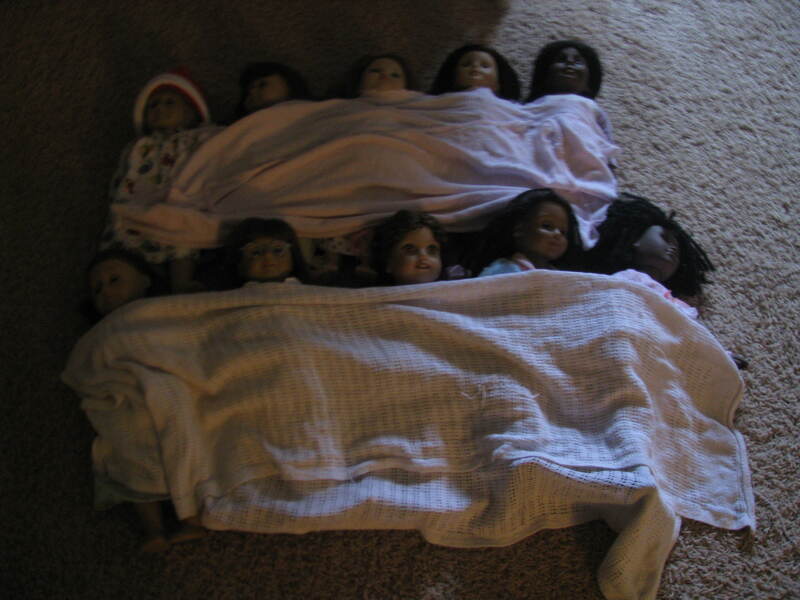 Then the dolls were snug in their beds, visions of sugar plums danced in their heads. They could hardly wait for the next morning. They could hardly sleep. 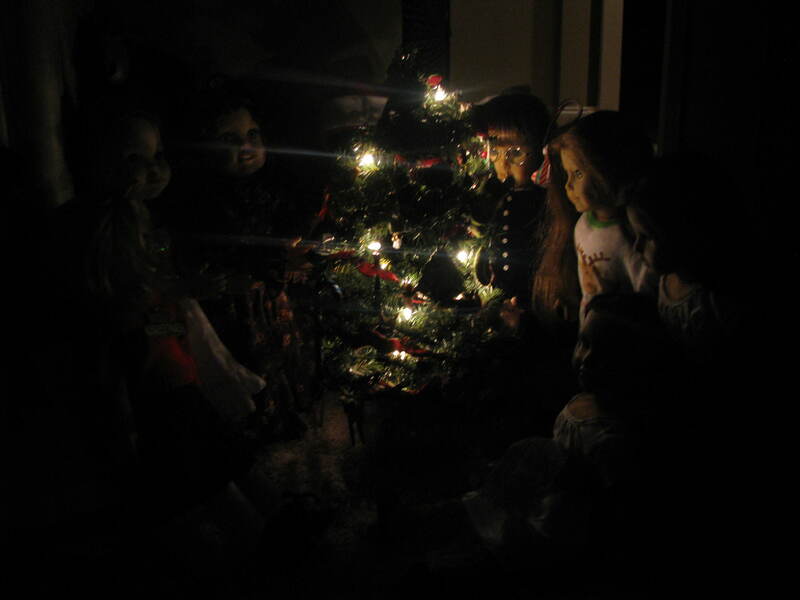 They prayed a good-night prayer and thanked the Lord for Baby Jesus and everything He has given them and to have a blessed Christmas Time!!! Thank you Everyone! Have a safe and Blessed Christmas and remember Jesus Loves You! COMMENT AND RATE! Join us tomorrow for the Christmas Morning Special!!! Thanks! 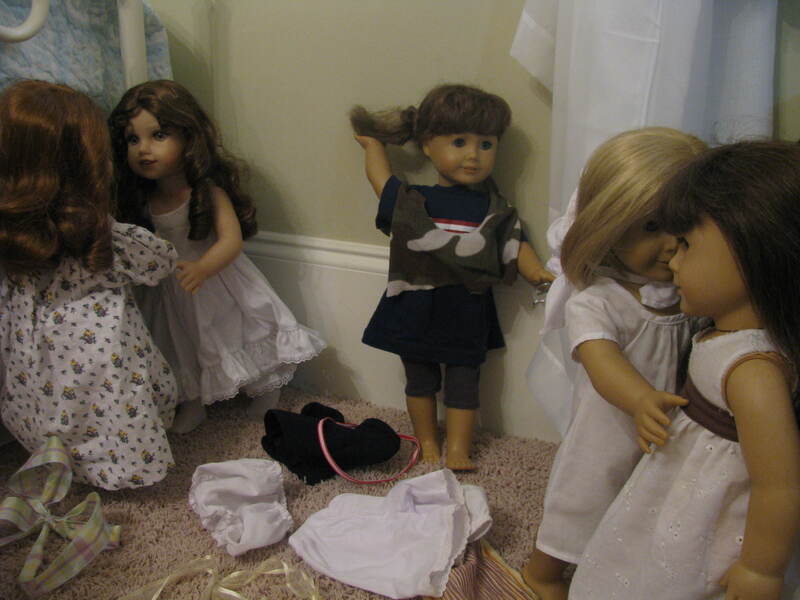 The AGDC dolls bursted into the hallway. Still snug in their Bible costumes they hugged and congratulated each other of how good they did in the Christmas play. Laughter and relieved sighs filled the room. Every body started to take off their costumes. Head pieces were thrown to the floor and girls began taking their hair out of buns. They chatted with their best friends and gathered up their modern clothes to change back into. Molly had to yell a little above the excitement and quick chatter. “Everybody! Can I have your attention please! Ok,” she began. “After everybody is done chcnging out of your costumes and done handling and fixing up the stage, everyone please change into your Christmas dresses and meet me. Ok? 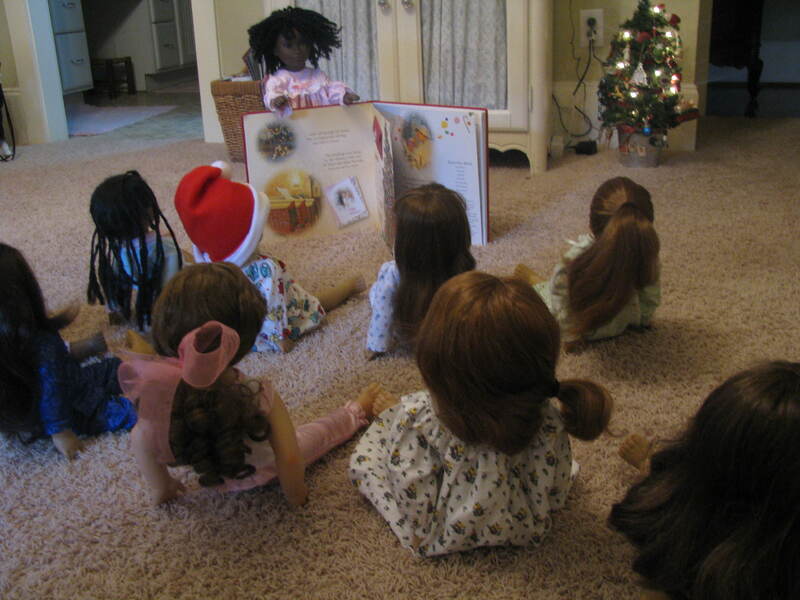 We are going to have a Christmas party!” The girls listening to Molly cheered, they all liked parties. Everyone quickly obeyed Molly. 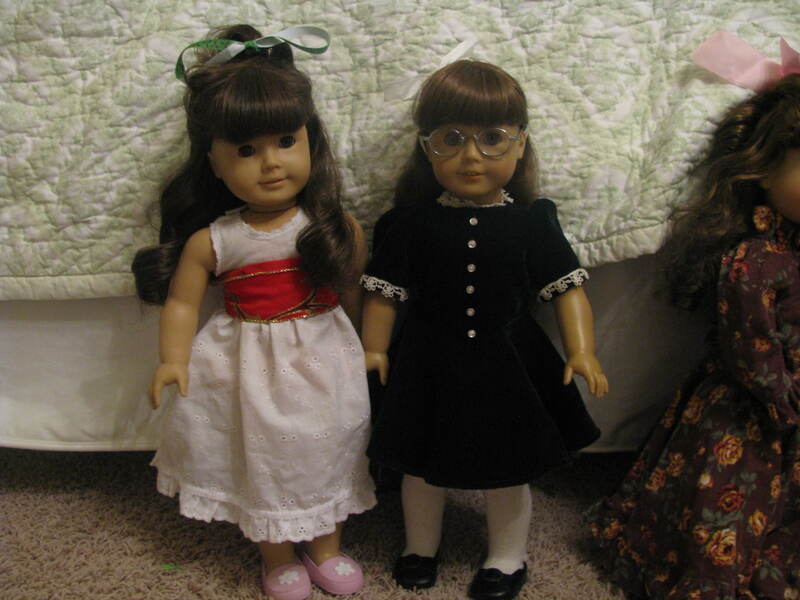 The twins, Elsie and Kathleen, were the first to get their dresses on, the ones they were planning to wear for Christmas. Elsie chose her yellow party undergarmets then over that chose her floral flannel skirt great for fall/winter, with the matching jacket. Elsie was straightly imported from 1850, so therefore her clothing choices were always like this. 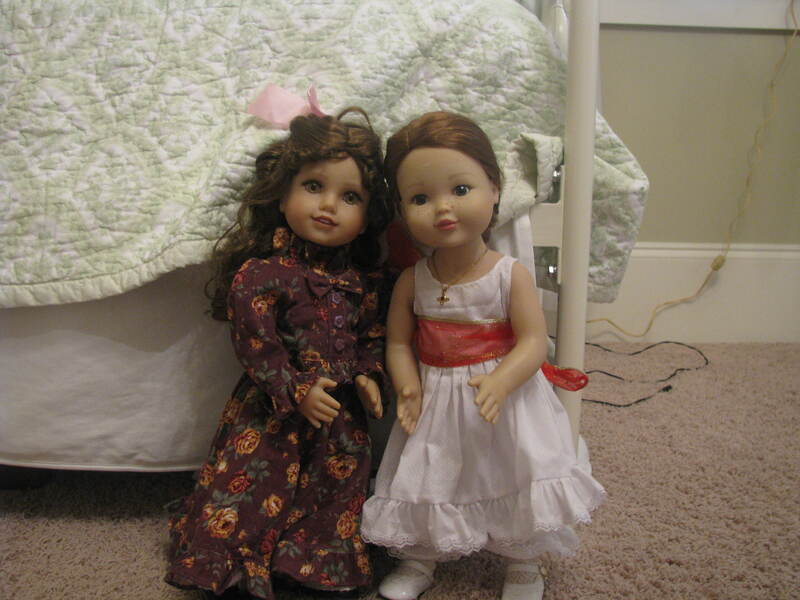 Now, only 2 dolls of AGDC were actually modern dolls, but all the other historical dolls had gotten used to modern life immediantly. But Elsie could not be broken. She believed that this was the modest way to dress, and the way the Lord would be pleased with her wearing. Although she did not find in sinful in the way her modern sisters dressed, because it was not innapropriate according to nowadays, and they believed it was modest. 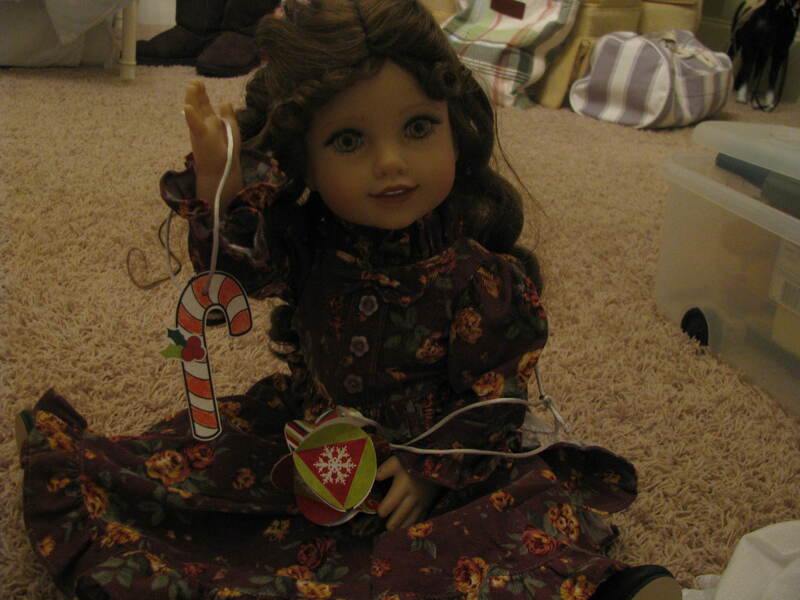 Kathleen chose her sister’s underclothes and turned it into a nice dress with a big Christmas bow around her waist. 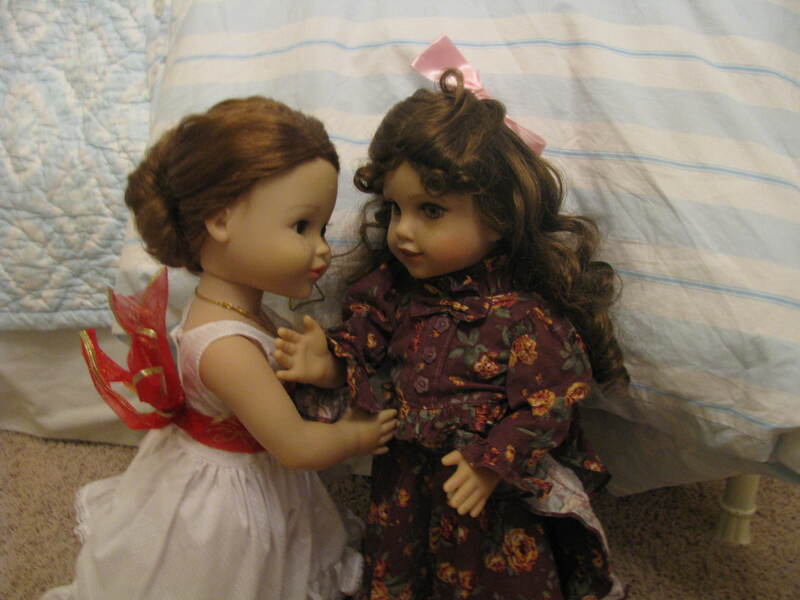 Josefina let Kathleen borrow her necklace, and Kathleen promised to take care of it, while pulling her hair into a bun. Samantha and Molly were next. Samantha wore her white gown and tied a big Christmas bow around the waist, similar to Kathleen’s. Sam also chose to curl her hair, then to finish it off, she tied a green mistletoe bow in her hair. Molly wore her famous green Christmas dress with stockings and buckle shoes, then tied a white bow in her hair on the side of her head. 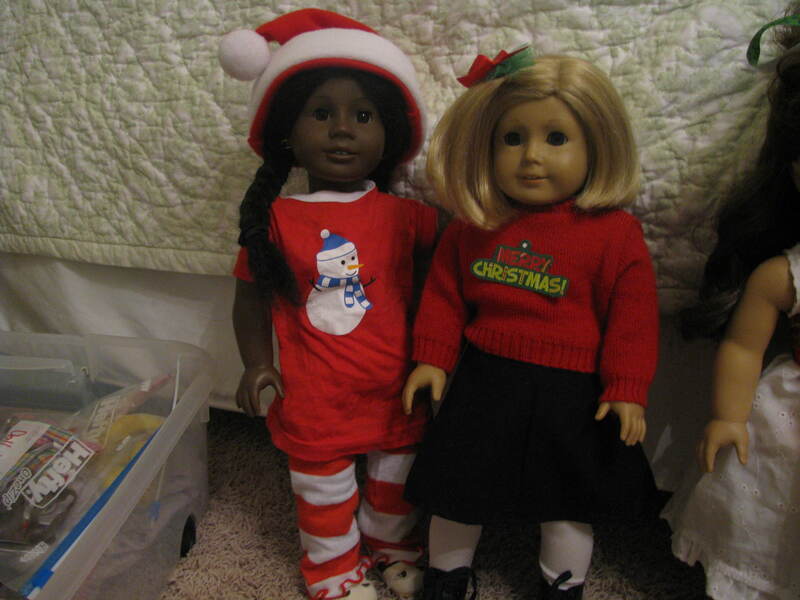 Lulu and Felicity Merriman had picked out nice-n-festive outfits. Luluhad chosen a penguin shirt and blue-striped leggings. She tied a big blue bow in her hair. She also had a snowmen hat, not shown in this picture. 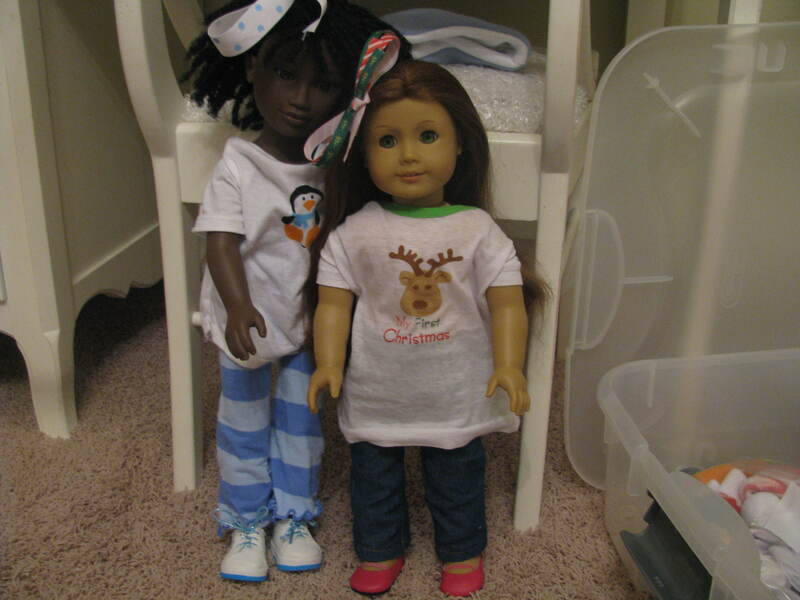 Felicity chose formal pants and a shirt displaying “My first Christmas” and a reindeer, although this was not truly Felicity’s first Christmas, but her second one. Her creativity showed in her hairbow. She had put two bows together they tied them as one in her hair. One hairbow was green with tiny Christmas trees on it, and the other was red-and-white striped like a candy cane. Kit and Addy were next. Addy had chosen an outfit similar to Lulu’s, a red snowman shirt with red-and-white striped leggings. Over her braids she wore a Santa Claus hat. Kit wore a red sweater and a blue wool skirt that belonged to Molly. She wore tights and boots, and her sweater displayed, “Merry Christmas!” She had a lilly-pad style bow in her short blonde hair. 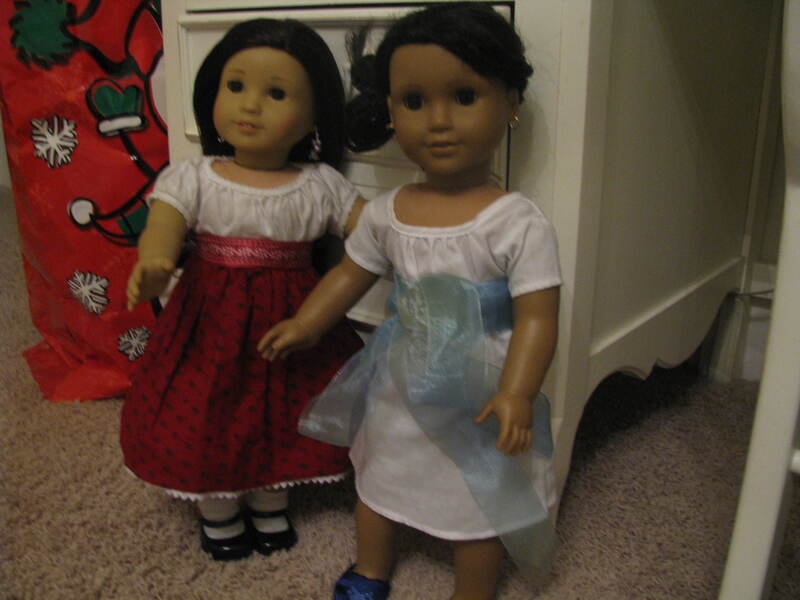 Eva Grace and Josefina were last to show off their outfits. Eva Grace wore Josefina’s camisa and skirt along with a Christmas bow tied around her waist instead of the original tie-around. She also wore her best butterfly earrings; made by Madeline; and shoes and socks, and wore her hair down. Josefina wore Felicity’s shift with a giant blue Christmas bow around the waist, blue Asian-styled slippers that belonged to Eva Grace. She took the beads out of her dreadlock braids and tied her hair into a bun. Her golden earrings shone in the sunlight coming through the windows. Next was craft time. 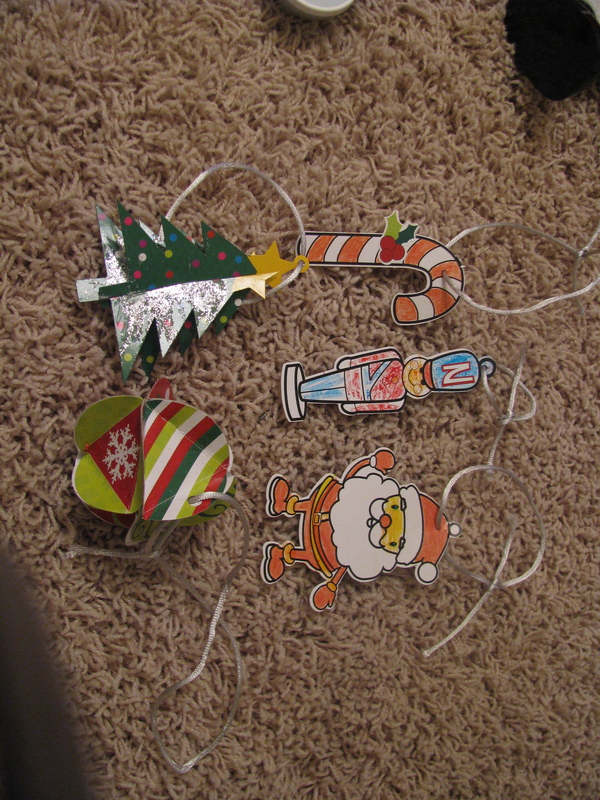 The girl’s craft was paper ornaments, and everybody went quickly to work. A working buzz filled the room. “Look at what I made!” exclaimed Addy after a few minutes. She held up a 3-D Christmas tree with silver tinsel glitter. The glitter shone brightly for all to see. The girls ‘OOOOOHHHHed’ and ‘AAAAHHHHHed’ at the ornament and clapped for their sister’s creation. 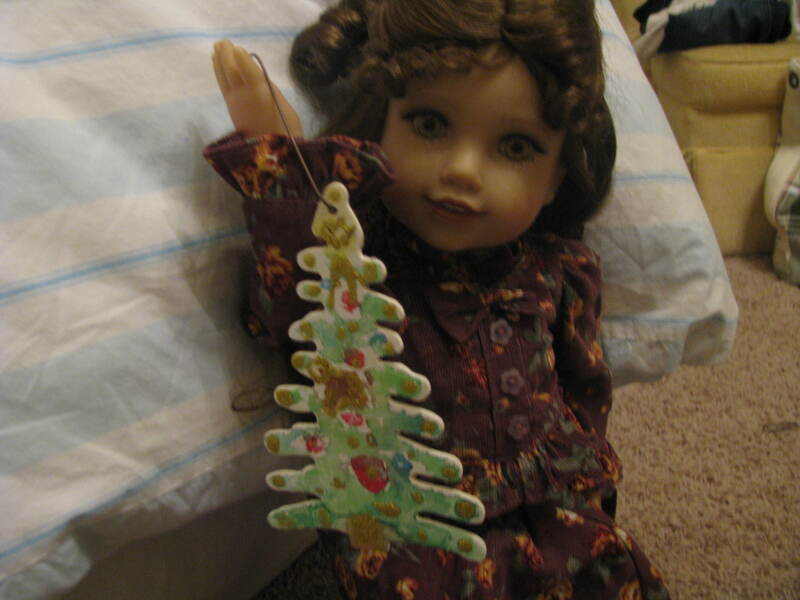 After a few MORE minutes of cutting and gluing and coloring and creating, Elsie held up two ornaments. “Are you fond of mine, sisters?” She asked politely. 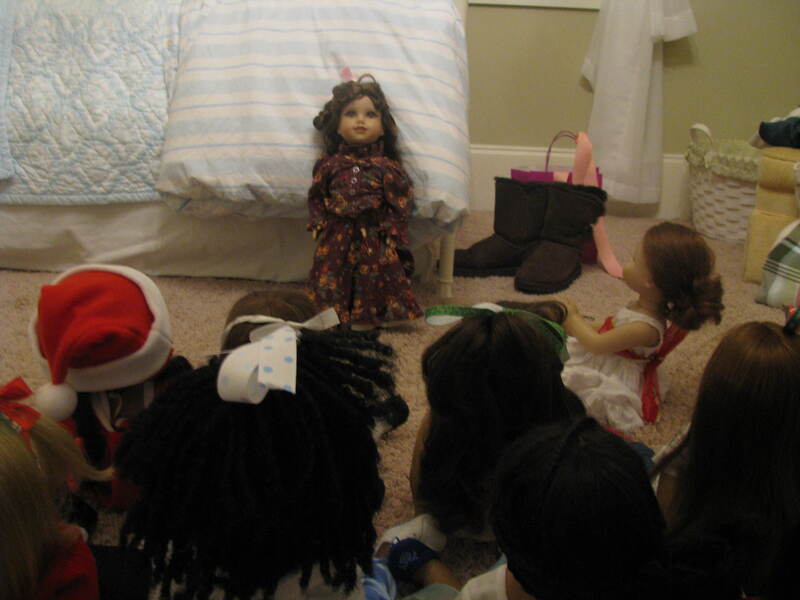 The girls clapped and cheered or her candy cane and 3D Christmas ball ornaments. 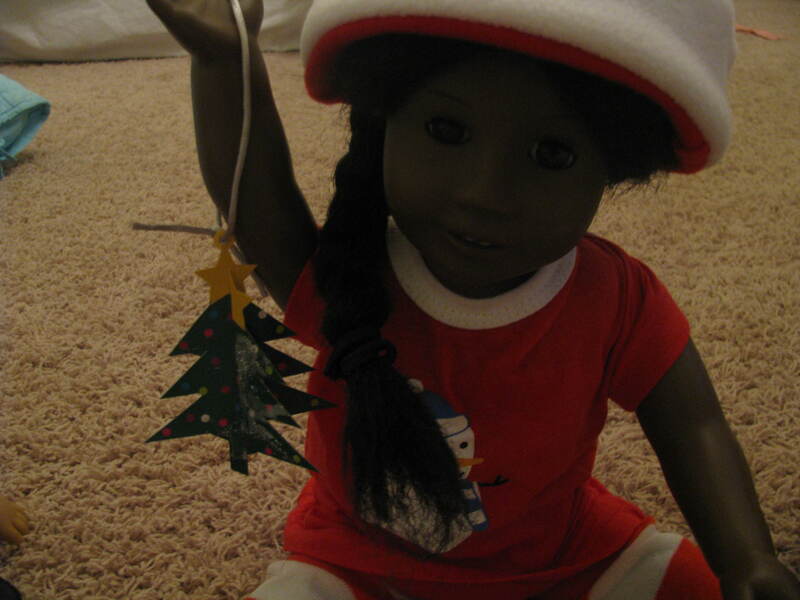 After everyone was finished, the dolls laided out the ornaments to let them dry. Next the girls had milk and cookies to celebrate and talk about Christmas time. Kathleen stepped tot he front. “Ladies and gentle girls, I give you, the amazing, moving, adorable girl, my very own twin sister, Elsie Rebecca Dinsmore!!!!! She has a very important message for all you today!” Everyone cheered and clapped and Kathleen sat down near the front. Elsie cleared her throat and went up. 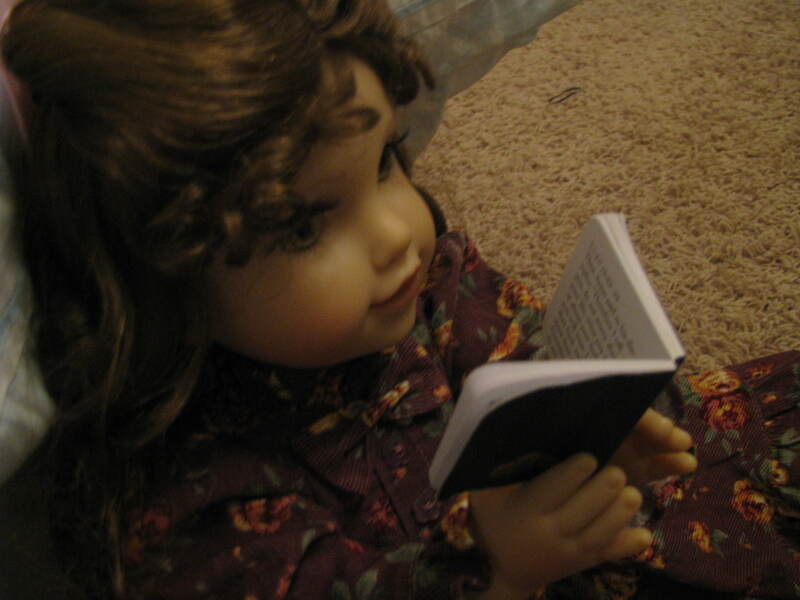 “Um… Hello, everyone… it’s um, me, Elsie Dinsmore, your sister-in-Christ AND by doll.” Then, there was a click in Elsie’s brain and she got more comfortable. “Have you ever wondered..” she began. “What Christmas really is all about? Have you ever wondered where it came from? Why it’s a holiday? Why it is such an impact?” There was a ‘yes’ and some ‘MMMhhhmmmm’s coming from the crowd. There was a hand as well from Kit. Elsie pointed at the hand. “You think you know? Tell us.” Kit cleared her throat. “Um… Isn’t it because a holiday we give? A holiday of giving? 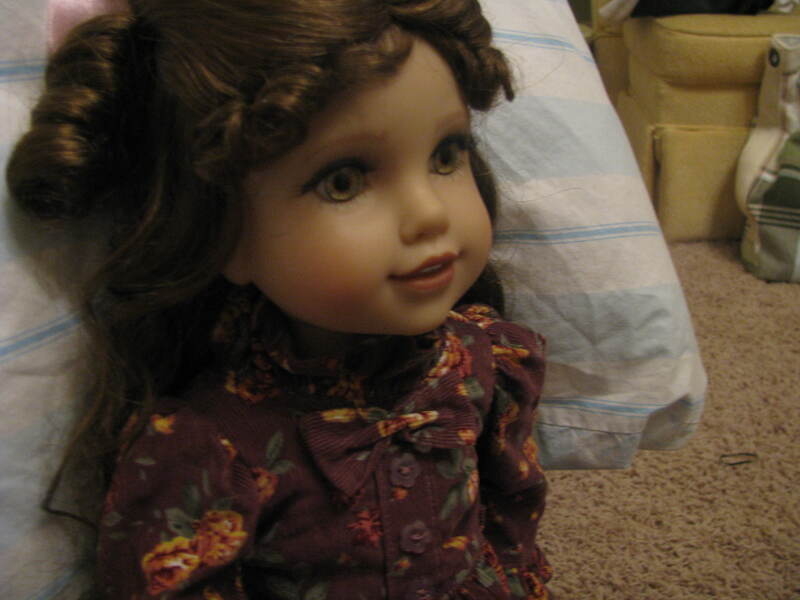 And being thankful?” Elsie tilted her head. “Partly, partly. But not the true reason. 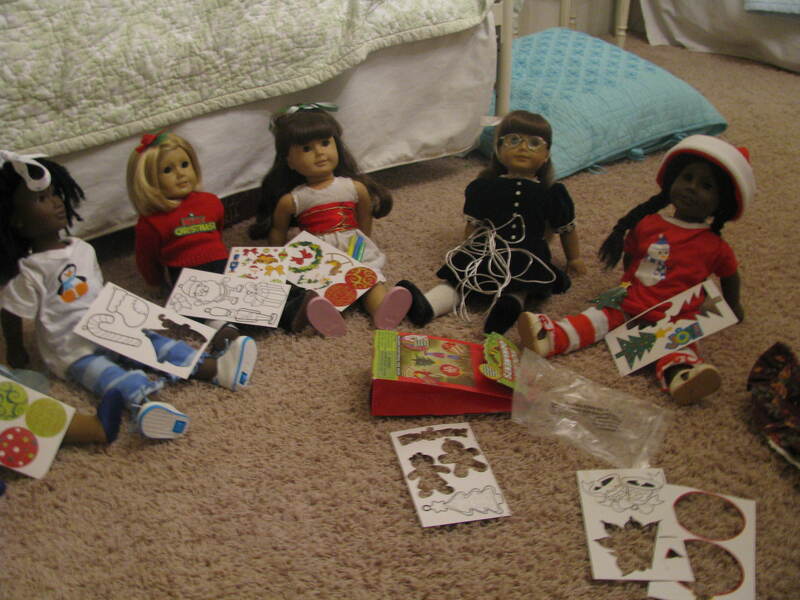 Did you know that Christmas is a-very-special-someone’s birthday?” Guesses rose from the dolls. “Luke 2:1-20. And it came to pass in those days that there went out a decree from Caesar Augustus that all the world should be taxed. And this taxing was first made when Cyrenius was governor of Syria. And all went to be taxed, everyone into his own city. And Joseph also went tup from Galilee, out of the city of Nazareth, into Judaea, unto the city of David, which is called Bethlehem; because her was in the house and lineage of David: To be taxed with Mary his espoused wife, being great with child. And so it was, that while they were there, the days were accomplished that she should be delivered. And she brought forth her firstborn son, wrapped him in swaddling clothes, and laid him in a manger; because there was no room for them in the inn. And there were in the same country shepherds abiding in the fields, keeping watch over their flock by night. And, lo, the angel of the Lord came upon them, the glory of the Lord shone round about them, and they were sore afraid. And the angel said unto them, Fear not: for behold, I bring you good tidings of great joy, that will be for all the people. For unto you born this day in the city of David, a Saviour, which is Christ the Lord. And this shall be a sign unto you; Ye shall find the babe wrapped in swaddling clothes, lying in a manger. And suddenly there was with the angel a multitude of heavenly hosts praising God saying, Glory to God in the highest, and on earth peace, good will toward men. And it came to pass, as the angels were gone away from them into heaven, the shepherds said to one another, Let us now go even unto Bethlehem, and see this thing which has come to pass, which the Lord hath made known unto us. And they came with haste, and found Mary, and Joseph, and the babe lying the manger. And when they had seen it, they made know abroad the saying which was told unto them concerning this child. And all they that heard it wondered at those things which were told them by the shepherds. But Mary kept all these things, and pondered them in her heart. And the shepherds returned, glorifying and praising God. 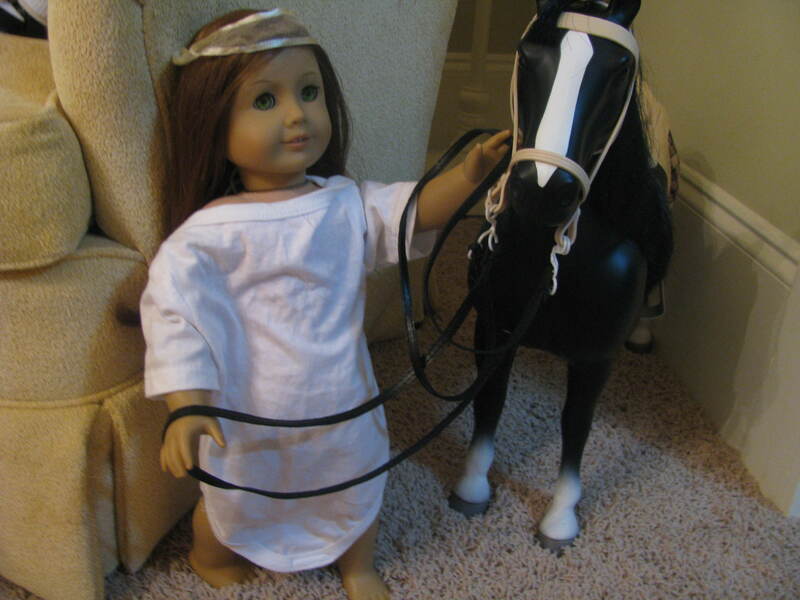 for all the things they had heard and seen, as it was told unto them.” Elsie finished. 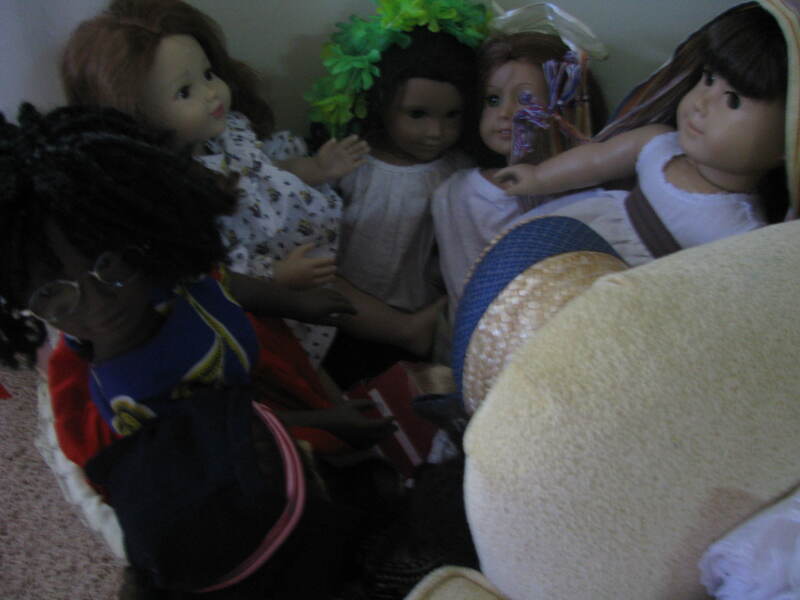 There was a loud clapping and cheer from the crowd of dolls. “True, Josefina. They sometimes can But that wasn’t the intention. You see, most Christmas traditions and symbols have a lot more to do with Christmas then we think. This Candy Cane, here, was created for the benefit of Jesus, according to legend. A german candy maker wanted to create a candy that pointed to Jesus. Then he came up with the candy cane, well known around the holidays today. The candy is hard, to represent that Jesus is our Rock of Life. The shape of the candy cane was 2-in-1. 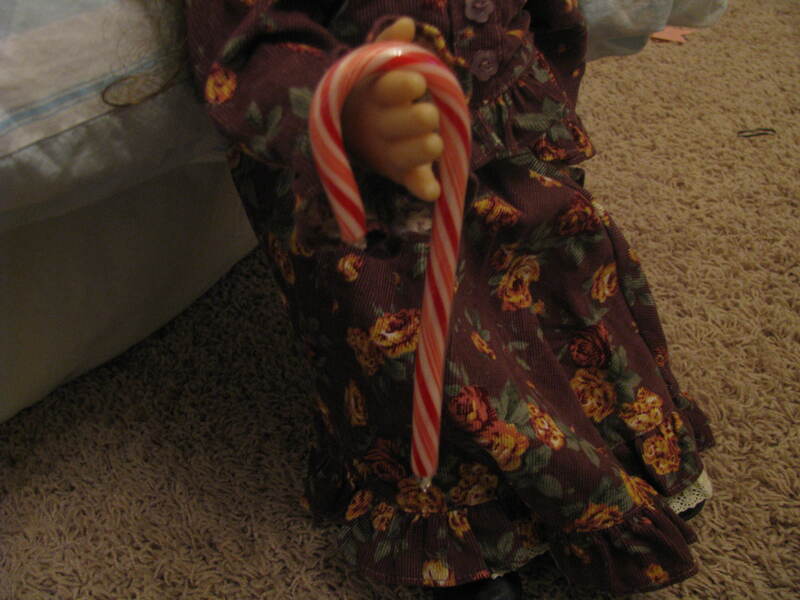 Tilted upwards, the candy cane is like a shepherd’s staff because Jesus is our shepherd and we are his sheep. Tilted upside down, the candy cane symbols a J for Jesus. The flavor is peppermint, which is similar to Hyssop, which was used a long time ago for purification and sacrifice. The red stripes are representing Jesus’s blood. Sometimes smaller, thin red stripes are added to show the stripes from when the Roman soldiers whipped Jesus because of OUR sins. Sometimes also green stripes are added, to show that Jesus is a gift from God.” There was a cheer for the audience and suddenly it seemed as Candy Canes were signs of Jesus. Which they were, by the way. “What about presents?” asked Samantha. Elsie nodded. “Yes, presents. What about presents you may ask? Partly what Kit said. Christmas is a time for giving and thankfulness as well as the birth of Jesus. Why, though? Jesus is behind it. It is believed we give presents like the Wise Men gave their most precious gifts to Jesus, as well as others did. God also gave His precious gift, His only son Jesus. Jesus was a gift from God. It is fun to receive presents, sit around the Christmas tree, and eat Candy Canes, but we can’t forget what they really mean.” Everyone cheered not only for Elsie but for Jesus. This would truly be the best Christmas ever. Everyone gathered around the tree and sang Christmas carols and prayed that everyone would receive the best gift ever-Jesus Christ. I hope you all have a very MERRY and BLESSED Christmas and that you ALL receive the great gift of Baby Jesus!!!! Comment and Rate!!! Join us tomorrow for Christmas Eve and the next day for Christmas Morning! Thank you ALL you guys for everything. You are truly awesome.